n Powers & Perils, only Shadow Weavers can use Shadow Magic in any way. Given the possibilities inherent in Shadow, it can be covered in greater detail. This is the purpose of this article. 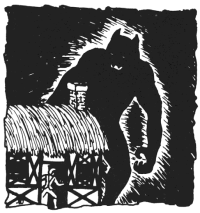 In the following pages I detail the costs and powers for Shadow Magic, the place of shadow in Powers & Perils and shadow creatures you may add to your campaign. In detailing the art of Shadow Magic the format in Book Two of Powers & Perils is used. When a player completes an apprenticeship in Shadow Magic he gains the ability to cast Starting MEL+2 Shadow spells. He also learns to speak the Tongue of Shadow, a new Supernatural Tongue, at EL60. There are no other gains for mastering this form of magic. Innate Shadow Weavers, once trained, cast Shadow Magic as trained Natural Magicians, gain double the number of spells listed above and speak the Tongue of Shadow at EL80. The cost of apprenticeship is 150 expertise points. If the student is a trained wizard or shaman, he may learn Shadow Magic at a cost of 100 expertise points. If he is an innate Shadow Weaver the cost in 80 expertise points. Shadow magic is unaligned. The player need not specify any orientation for his Character if he is only using Shadow Magic. If he is also a trained wizard or shaman, the normal orientation rules apply. Persons adept in Shadow Magic, other than Natural Magicians, pay double cost to learn and cast spells derived from Light, Darkness or Elemental forces. They may learn and cast spells that ADVERSELY affect the Mind or Energy Level of an enemy at 1/2 the normal cost, rounded up. Neither modifier applies to Shadow Magic spells. A Shadow Weaver's starting MEL on the Starting MEL table (Book Two of Powers & Perils) is determined by (W+Em)/2, rounded up. If the Character is a trained wizard or shaman, the experience listed is added to that gained for his other apprenticeship. The expertise is ignored (See Starting Knowledge above). If the Character is an innate Shadow Weaver use either Will or Empathy, whichever is higher, to determine his starting experience. The Starting Expertise Level in Shadow Magic equals WILL divided by 40, rounded down. If the character trained is a natural Shadow Weaver his Will is divided by 20 instead of 40. After this skill is learned, competence in any of the spells increases with expertise as for other forms of trained magic. Spells above the Starting Knowledge allowed are also learned in the normal manner. Shadow Magic only affects creatures that cast a shadow. Shadow Magic only operates where shadow exists. If there are no shadows, Shadow Magic is impossible. The table below lists the spells available through Shadow Magic. Where it applies, the powers of the innate Shadow Weaver are modified to fit the appropriate spells in this list. The spells that this applies to are marked by an asterisk. This spell allows the caster to communicate with the Shadow of any being within his range. It MUST be cast using the Tongue of Shadow. It is used to gain general information about that person's orientation, intent and personality. It may not be used to establish communication with that person. When this spell is used, only 1/3 of the target's MDV, rounded down, can be applied in defense against it. Unless he rolls Em or less. the target is unaware that any communication is taking place. Duration 12-EL phases (the time required to learn the information specified above). The caster can create Shadow Warriors. The maximum number possible equals the EL cast+1. The caster loses one energy point per warrior per full turn that they remain, in addition to the mana or energy required to create them. Cast at TRIPLE cost, the spell allows the caster to form a single warrior with 1+(EL/2), rounded up, times the normal Shadow Warrior values, i.e. a single EL4 warrior costs 30 mana to summon, takes 30 hits, has a strength of 75, etc. When this is done, the shadow's MR is reduced by ONE per multiple over one. The cost to power it is increased by ONE per multiple over one, i.e. the EL4 shadow above has a MR of 13 and costs 3 energy per turn to maintain. Shadow Warriors appear to flow out of the caster when formed. They move as the caster directs. While controlling more than one warrior the caster can do nothing else. While controlling a single warrior he may use other Shadow Magic, move or engage in other physical actions. NOTE - Innate Shadow Weavers may command any number of warriors witfiout suffering the restriction above. Instead of using the base cost specified in Book One, determine an EL as an Innate Power for this spell. Treat it as an innate power in all ways unless the Shadow Weaver is trained. Once he is trained, this spell starts at his Innate EL, can be cast at that EL or lower and can draw from either the Casting Ability or the Energy Level. The Duration is as for the Shamanic spell of the same name. The range is (EL+l) x 5". The caster may not use the spell to include others. It is not usable in total darkness and does not grant better than normal vision. The victim's own shadow is turned against him. To use this spell, the caster needs blood and hair from the person to be affected OR he must have cast Soul Sight on that person's shadow within the last 24 hours. If neither is true, the spell is an abysmal failure. If both are, the caster may subtract TEN from his roll in addition to normal modifiers. A victim cursed with a Deadly Shadow can only be cured with a Negate Curse spell. Each day that he fails to roll his Will, the shadow's attack drains 2D6+ EL energy points from him. When his EnL reaches zero he is dead. While the Shadow drains its victim, the victim loses Strength, Stamina and Constitution equal to 1/2 the energy lost. When one characteristic reaches zero or less, the victim's MR, OCV and DCV are reduced 50%. When two are at zero or less he is in coma. If all three reach zero, he is dead (even if he still has a positive EnL). The victim sees movement in the shadows around him. Positive that he is surrounded by an overwhelming force, he will surrender unless he rolls Will, minus the EL modifier. On this roll, failure causes the victim's immediate surrender, partial success causes him to flee in a random direction (intent on fighting his way to freedom). On success, he may ignore the spell. Cast at DOUBLE cost, this speli affects everyone in a circular area defined by its radius. All act as specified above. Any whose MDV is higher than the MDV limit automatically ignore the spell. Where such a person is within the effect area, affectable persons may roll Will x 2 to resist instead of Will. Duration 2 turns (EL factor applies as a power). As for the Chaos spell of the same name. This spell weaves misleading shadows that delude the mind and make it impossible to judge distance and direction. The caster is not affected by this spell. While it is in effect. he may not cast any other type of magic, including shadow magic. This spell regenerates the caster's Energy Level. If an additional Mana Point is paid, it may be used to raise the energy level of some other person on touch. When using the spell on himself, the caster subtracts his MDV from the roll in addition to normal modifiers. If the spell results in failure, the energy recipient loses 1/2 the energy he stood to gain. If it is an abysmal failure he loses as much energy as he would have gained. If the loss lowers the EnL below zero. the recipient is dead. At zero he is in coma. This spell may not be cast on the same person more than once in a given day. If it is, the target is in coma for one hour per energy point he would have gained. Unless he rolls his current energy level or less, his EnL is reduced to zero and he is in coma until a Negate Curse spell wakes him. After the initial duration, one roll is allowed every 24 hours. The spell forms a dark shade that attachs itself to the victim and drains his soul. Unless it is dispelled, or the caster is killed before it has its full elfect, the victim is doomed. lf the caster has the target's blood. hair or spit to use in casting, the shade must be banished magically if the person is to be saved. It cannot be banished magically if the person is to be saved. It cannot be affected by any weapon or spell except a Dispell/Banish spell. A powerful paralytic spell that inflicts physical damage on its victim. The caster must touch the specified target within the number of phases in Duration One. If he doesn't, he loses energy equal to the damage specified below and the spell is wasted. Duration Two is the number of phases the victim is affected after being touched. The caster may perform no other magic while he wields this spell. If he does, the spell ends. Any part of Duration Two that remains for any victim is lost when another spell is begun. As for Invisibility in Powers & Perils. The spell may only be used when the caster is in shadow. NOTE - Innate Shadow Weavers are not required to cast this spell. Whenever they enter a shadow, and choose to be invisible, they pay the mana points required for the EL used and are. If trained, they may use an EL less than or equal to their innate EL. This spell allows the caster to leech energy from the shadow of another being. The target receives his Full MDV in defense. Success increases the Energy Level and/or Casting Ability of the victim's EnL and Casting Ability (if he has one). EXAMPLE - An EL4 spell is cast and succeeds. The caster's EnL and Casting Ability are increased by a total of 25. The victim's current Energy Level and Casting Ability, if he has one, are EACH reduced 25. IMPORTANT - If a spell takes more energy or mana than a person has, it takes what he has in that area and no more. At no time may the total points received by the caster be greater than 1/2 the amount drained, rounded up. EXAMPLE - An EL4 spell succeeds against a man with EnL20 and no magical training. The caster drains 20 killing the man. He receives 10 points to assign to his EnL or Casting Ability. IMPORTANT - No more than 2/3 of the points gained, rounded up, can be assigned to any one area. The remainder must be assigned to the other area. No points may be assigned to an area where none have been used or lost. Points that cannot be assigned due to this are lost. EXAMPLE - An EL2 spell gains the caster 15 points. He assigns the maximum, 9, to his EnL. The other 6 are subtracted from his Mana Points used, moving him back towards his full Casting Ability. If his energy level is at full strength, he loses the 6 that have to go there (assigning the minimum there). As for Liberate Spirit except the caster sends his shadow on a specific mission. It returns when the mission is complete or it is recalled. While the shadow is gone, the caster is unaware of his surroundings and of what the shadow is doing. He is defenseless. The only action he can take is to recall his Shadow, which requires a Will roll. The EL modifier for this spell increases his chance of a successful recall. Once the shadow returns, the caster will know what it saw and did while it was gone. Per turn that it is gone, the caster loses 1D6 energy points. After a successiul recall, the shadow returns in 1D2 turns. If it exceeds the recall range in performing its mission, it must be summoned (CL1) to be recalled. This spell can be cast at THREE times normal cost on a willing person other than the caster. When this is done, that person suffers the disadvantages above. However, the caster will be able to monitor the activities of that person's shadow and direct its performance of the mission in an intelligent manner. The person whose shadow is sent must still recall it. He is allowed to add 1/2 the caster's Will to his own in doing so. If he fails the caster must summon the shadow and force it back into the person's body before that person dies. NOTE - Shadow Weavers have this as an innate power. Their EL is determined as specified in Book One. They may liberate their spirit, with no EL modifier, at their innate EL. They may operate as normal while it is gone except they may not cast Shadow Magic. If trained, they cast the spell at 1/4 mana cost, rounded up, at any EL less than or equal to their innate EL AND receive the normal EL modifier. They may not liberate another person's shadow unless they are trained. The caster can create dark bands, within his range, to chain one enemy per band created. If the strength of the target exceed the strength for the EL cast, the bands can not affect him. If not, they enfold him and prevent him from taking ANY action for the entire duration. Once the spell is in force, the caster can direct the bands against any target he desires as long as he does not move and does not cast any other magic. He must hit these targets, using his MEL x 2 as his OCV on the Combat Table. Against the initial targets of his spell this restriction does NOT apply. As for the shamanic spirit cage spell, with restrictions as specified for Deadly Shadow. The caster must have a crystal sphere or prism to serve as the cage. It can be cast against shadows that are still tied to their body. If it is cast against free shadows, subtract TWENTY when rolling for success. A person whose shadow is stolen in this way wastes away, losing 1D6 energy points per day until he dies. The only way to save him is to find the item containing his shadow and smash it to release the shadow. Anyone aflected by this spell rolls Will+MDV, minus EL modifier, to resist the wishes of his soul. If he makes this roll, he may attack the caster but must add the EL modifier to all combat and magic rolls. If the roll is not a success, he must work towards performing the command that has been placed on his shadow. Only a single command may be placed. In all other ways, it operates as for Compulsion. The spell strikes the victim with Plague by affecting his shadow. In all other ways, its effect is as for the Plague spell, except the contagion is passed when his shadow comes in contact with the shadow of another living creature. Only a Negate Curse spell can cure the spell before the duration, as specified for Plague, ends. The caster can sculpt shadow into usable inanimate objects. He is limited in the number of shadow objects he can have at one time. Unless he makes the item permanent by recasting the spell at five times normal cost for the EL used, items that he creates dissolve if anyone else touches them. Items created with this spell must be items that the caster has personal knowledge of or that he is capable of making normally. Cast at the normal cost they are dark objects of solidified shadow. At double the normal cost they have a normal appearance AND can be animated if they have the shape of an animate creature. To animate such an item the caster must allocate EL x 2 points from his EnL to the item. While the item lives, it retains these points and the caster cannot regain them. When it is dispelled or dies, he may regenerate them as normal. In essence, the caster breaths a soul from himself into the item. Animated items of this type have stats as for Creations and will defend their creator fanatically at all times. As for the Shamanic spell of the same name. Sometimes used with the Deadly Shadow spell to curse enemies. The basic parameters of this spell are as specified for the Freezing Hand. If the caster touches his chosen victim the spell drains energy from him and causes him to age. If he fails to touch him, he suffers the damage he would have done to that person. For Range and Duration see Freezing Hand. IMPORTANT - Those effected are stunned one phase per year that they are aged by this spell. If they are aged more than four years, they pass out for 2D10 turns. This spell has 1/2 its energy draining effect and no age effect on creatures with greater than human life spans. Now we have the basics of Shadow Magic. From here, we need to create the Lord of Shadow, his realm and some supernatural shadow beings for your campaign. Lord of Shadow, Destroyer and Servant of Light. Enemy and Ally of the Greater Darkness, Walker in the Shadows, Lord of Infinite Shapes, Marshal of the Kiana'shan, Master of Hidden Thoughts, Foeman of Eternity, Immortal patron of Selfish Action, the soul of Willfulness. Lord Kejan mirrors the schizoid essence of Shadow. He is dedicated to both the preservation and the destruction of both Light and Darkness, his enemies and the forces that, together, make his existence possible. His realm, and the creatures within it, mirror his unpredictable nature. His realm is a land of perpetual shadow where neither light nor darkness can be pure or total. Because of his nature, Shadow often aids Balance but never aligns itself with other forces. It is an independant force that can be both a strong ally and a terrible enemy to any with the courage to dare its power. The terrain in this reaim is psychotically angular and twisted badlands. Shadow lies throughout the land and, everywhere, is a living force. In the center ot this area, on the Summit of Shadow lies Kejan's Citadel, the central focus for the power of Shadow and the throne of Mulabe Kejan. Except for the forces of Shadow there is no life in this area. Living beings who enter the realm waste away as the substance of living Shadow drains the power of their being from them. Even their own shadow, metaphysically a reflection of their inner self, aids its brothers in accomplishing this goal (seeking to liberste itself from the fleshy cage and being that forces form and substance on it). Except for beings with innate ties to Shadow, and forces with a contact level of TWO or higher, any being who casts a Shadow that enters this realm is in danger. The following creatures derive their substance, power and being from Shadow. All are supernatural forces with magical powers. All can be quite deadly in the right circumstances. Per individual summoned the NF listed appear. If any are killed, the survivors disappear with it, i.e. four of them appear, one is killed, the other three leave to plot their vengeance. 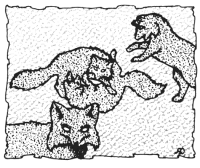 APPEARANCE - Shadow-foxes appear to be the shadow of a large fox except for their silvery teeth and claws. Whether substantial, or insubstantial, their appearance is the same. Only an extremely empathic person, or an innate Shadow-weaver, can detect the difference between these two states. SPECIAL - These beings are extremely intelligent, sociable and capricious. They are never encountered alone, the fewest ever found together is two. They are capable of communicating with any human and, in most cases, enjoy doing so. They are mischievious and curious. Many a mortal who has been befriended by them has regretted their kindness. All Shadow-foxes use MEL4/EL2 Insubstantiability. When they attack, one remains substantial to bite while the others try to draw the enemies blow in their insubstantial form. As the battle progresses. they shift form repeatedly making it impossible for most people to determine which of them is solid at a given time. In large numbers, they can be a terrible enemy. If the Referee wishes, the Shadow-fox can be encountered in the Middle World. It prefers Forest, Swamp, Plains and City Margins if you add it to your encounter list. NOTE - Though relatively friendly, these beings are known for their intelligence and their love of vengeance. To kill one, and not kill its brothers, is guaranteed to inflict the killer, and possibly the summoner, with a ``plague of foxes'' for years. * The creature has average values for the shape it takes in all characteristics. ** The creature can only be effected by certain weapons. If the attacker has such a weapon, the NAV is zero. *** OCV equals 3+SB+StB at the time. DCV equals (MR/5) + DB+ AB at the time. Both vary with the form the creature is in. APPEARANCE - Kiana'shan are an amorphous blob of Shadow. In combat they adopt the form of some creature or man. At this time they appear to be the solidified shadow of that being. SPECIAL - The Kiana'shan can take any shape that they wish and hold it for as long as they desire at no further cost. They are immune to damage from any attack, normal or magical, except for Light or Darkness Powers or any item with those powers in them. Kiana'shan are energy leechers. In addition to any physical damage they score in combat, any target wounded loses 2D6+ 4 energy points. If, at any time, the total energy consumed exceeds 1/2 the Kiana'shan's energy level, it departs. APPEARANCE - An immense anthropoid more than 20 feet in height. The Shadow Beast has white tangs, silvery claws and is a solid, preternaturally dark, shadow. SPECIAL - When combat against this beast begins, roll its MEL without modifiers on the Magic Table. If the result is success it has the blessing of the Lord of Shadow, granting EL3 Luck and EL3 Invulnerability. Any other result indicates that it does NOT receive these benefits. Other than this power, the beast is strictly a physical force. It can be encountered normally, at the Referee's discretion, in Hill or Forest areas. It can also be summoned from the Upper World. It is the bane of creatures of Law and Chaos. It has slso been known to extend its hatred to the Kotothi and Sidh forces. Except for these hated things, thce beast rarely attacks other forces except im self-defense or to protect something it is warding. These are the basic forces of Shadow. If you adopt this article and use it in play, feel free to modify it as you wish. Many additional powers, creatures and forces can be derived from Shadow. The items presented here are just the tip of the iceberg, let your imagination roam to discoven other elements of its power that are worthy of your campaign.